A few months ago, I wrote a post comparing the early sales of smartwatches to those of tablets and modern smartphones (early iPhone and Android models). As I expected, the numbers didn't bode well for smartwatches. Now that we have another year's worth of data to play with (from Canalys this time), we have an opportunity to test the validity of my previous analysis. 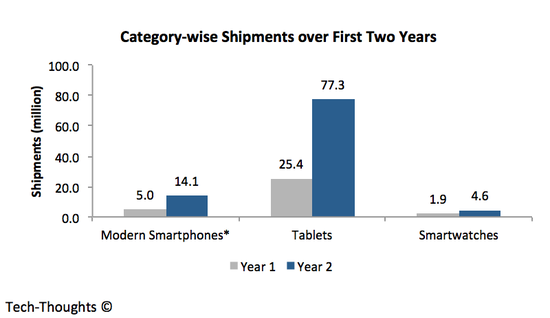 The chart above plots smartwatch shipments against smartphone and tablet shipments for two years after the point when each category was meaningfully conceived. Data on smartwatch shipments has been combined from multiple sources including Canalys, Strategy Analytics and ABI Research. Now compare this updated chart with my previous observations. In some ways, smartwatches have had the same advantages that tablets enjoyed. The interaction model doesn't seem drastically different (compared to the transition from keyboard/mouse to touch) and appstores are well established. They also benefited from Samsung's offer of a free Galaxy Gear with the Note 3 phablet. Despite these advantages, smartwatch shipments have remained well below those of early smartphones and tablets. It is clear to me that smartwatch technology has improved significantly over the past year. But the fact that this has had no impact on consumer adoption should be worrying. It is becoming increasingly clear that the use cases targeted by smartwatches (at least today) are primarily valued by a niche segment of technology enthusiasts. The list of questions about wearables, seems to be getting longer, but we are no closer to finding answers. The data in my chart includes all wearable wristbands, including fitness trackers. If we drill down to just smartwatches like the Pebble and Android Wear devices, year 2 shipments drop to around 1.5 million. The measurement period begins when products relying on the dominant interaction models are introduced to the market, i.e. a touch interface that does not require a stylus for smartphones / tablets. App developers play a major role in discovering use cases, but those still depend on the advantages and drawbacks inherent to the interaction model. Would Angry Birds be a viral hit if users had to fiddle around with a keypad? With this context, it may even make sense to exclude Pebble shipments to make a more accurate comparison (<1 million in Year 2).